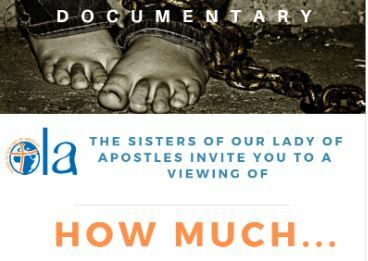 To Mark the UN International Day for the Elimination of Violence against Women, Sunday 25 November 2018, the OLA Sisters will screen the SMA documentary film on Human Trafficking ‘HOW MUCH’, by Antonia Guadalupi and Francis Rozario SMA. ‘HOW MUCH … ‘ exposes the life-threatening dangers and the brutal modern slavery that hide behind the seduction of the West. “The sands of Sahara have buried numerous ambitions and the Mediterranean waters have drowned loads of dreams. Those who survived the perils of the journey have just jumped from the frying pan to the fire – the slavery continues in the open air. Desperate people on one side and closed immigration doors on the other. There thrives a ruthless market shamelessly taking advantage of every existential vulnerability and putting a price tag on anything and anyBODY. Humanity is in danger! 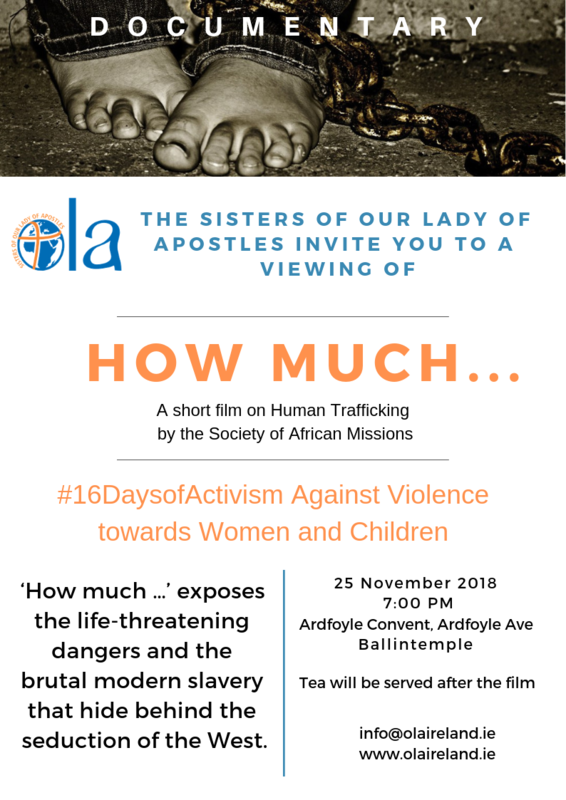 The documentary ‘How much …’ voices the buried, drowned and scattered dreams and ambitions of many young people, mainly Nigerians and exposes the life-threatening dangers and the brutal modern slavery that hide behind the seduction of the West. ‘How much…’ is the cry of the human conscience and a wake-up call to political leaders whose arms trades, corruption and insensitive foreign policies contribute to the human decadence of the twenty first century multiplying the number of desperate victims. Admission: FREE – Tea will be served after the film. For further information on the UN International Day for the Elimination of Violence against Women, click here.